Personalized baby gifts and nursery decor for kids. 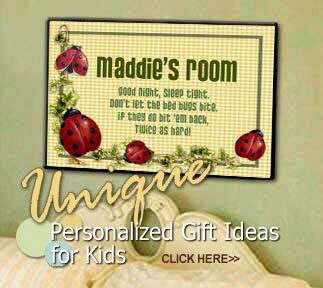 Unique personalized baby gifts and room decor for kids of all ages. Whether you're looking for a baby shower gift, unique baptism gift or the perfect addition to the nursery, you're sure to find it here. All of our baby gifts are customizable for any occasion. You can change just the name on each item or be truly creative and add birth dates and special quotes as well...and for no extra charge! Please read all personalization instructions before placing your order! If you have any questions or need help with the personalization please contact us and we will help you create the perfect baby gift.